Now this is an interesting news from Microsoft. It baffled me, surprised me, amazed me and then also compelled me to imagine the future of technology placement. Microsoft has placed its latest datacentre under the sea off the coast of Scotland. The technology giant is hopeful that if this experiment goes well, it will have more such sites in the future. Code-named “Project Natick”, this is an effort to produce a sustainable, pre-packaged and environment-friendly datacentre that could be made commercially viable if it works well. This datacentre, submerged in the sea, has 12 racks consisting of 864 servers and associated stuff. Naval Group of France is supporting Microsoft in this objective. The datacentre is contained in a submersible cylindrical system inspired by the underwater constructions of Naval Group. A triangular base (also called Subsea Docking Structure), ensures the positioning of the datacentre at the bottom of the ocean. A dual air-water system enables cooling of the datacentre, thus taking advantage of the temperature of the underwater environment. A remotely operated vehicle was sent 117 feet down into the sea to plug in this datacentre and bring it to life. 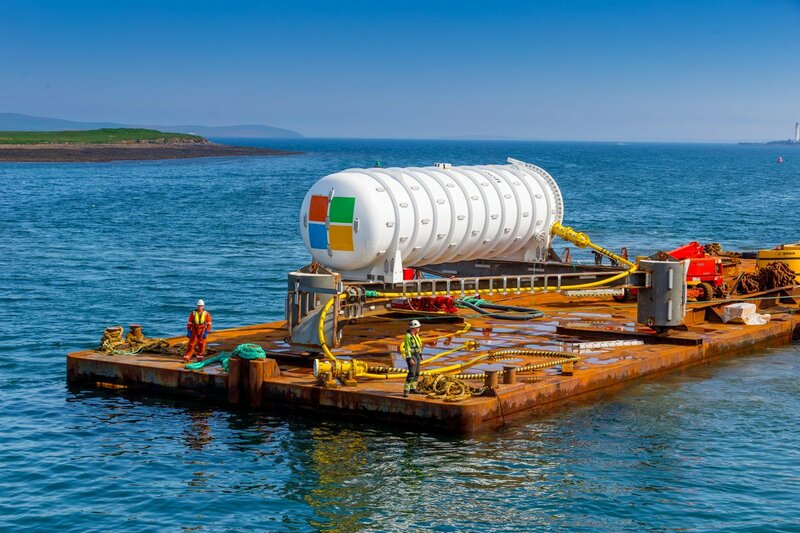 Microsoft is leveraging technology from submarines and working with pioneers in marine energy for the second phase of its moonshot to develop self-sufficient underwater datacentres that can deliver lightning-quick cloud services to coastal cities. The deployment of the Northern Isles datacentre at the European Marine Energy Centre marks a milestone in Project Natick, which is the result of years-long research effort to investigate manufacturing and operating environmentally sustainable, pre-packaged datacentre units that can be ordered to size, rapidly deployed and left to operate lights out on the seafloor for years. More than half of the world’s population lives within about 120 miles of the coast. By putting datacentres in bodies of water near coastal cities, data would have a short distance to travel to reach coastal communities, leading to fast and smooth web surfing, video streaming and game playing as well as authentic experiences for AI-driven technologies. Is Natick a cloud-killer? Is this the innovation that will create a rage in the industry? How would the industry respond to it? All these and many more questions are crossing my mind while writing this news story.